In an emergency you’ll need to provide and receive help, and after it’s over, you’ll have to return, repair, and rebuild. Central to this is communication and documentation. Our society loves red tape, especially after disasters. 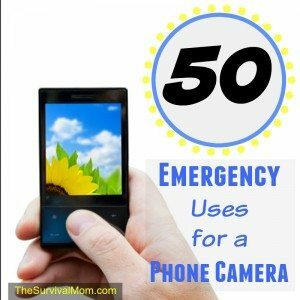 Below are 50 ways a phone camera can be used in an emergency to document, record, and relay important information. Any camera could be used for some of these things, but the phone camera carries a distinct advantage. It can immediately transmit your pictures. If you don’t have a phonecam, go with what you have, or what you can afford. Disposable cameras and digital cameras are acceptable. However, the phonecam rules, so let’s look at ways yours can be used in an emergency. These are excerpts from Disaster Prep 101. Whenever the family might be separated, take last-minute pictures of all family members, especially the kids, and pets. To send or receive directions to or from a location when voice directions aren’t working, draw a map on paper, take a picture, and send. Suppose help isn’t available, and someone’s sick or injured. If there are visible signs or symptoms, relay pictures to medical personnel who can walk you through whatever treatment is possible where you are. In catastrophes, it’ll be days before insurance adjusters get there to file claims. Photo all damage in case some of it gets repaired or cleaned up before agents arrive. If you see suspicious activity in your neighborhood, upload pictures of suspects and the situation to the police immediately. Gathering the family is critical. If you don’t have a fixed meeting place, send pictures of where and what you’re near so others can find you. This also works well if you’re lost in the wilderness and need to relay pictures of landmarks. If you have a fixed rendezvous point, send a pic you already have on file, so others will know where to meet. Take these photos while compiling your family emergency plan. When stocking up in anticipation of an emergency, take a picture of your pantry as a quick shopping list. If you’re trying to tell others where a certain location is, send a picture by picture set of directions. Create this file while assembling your family reaction plan. If your family evacuates, and they know where to go, but haven’t met the family contact person, send them a picture of the person they’re to meet, or send that person pictures of the people heading their way. If you’re evacuating, snap quick shots of your property to include purchases not on your last home inventory, and the current condition of your property. Take pictures to record what you do, where you go, and people you meet during an evacuation, etc. In a large-scale emergency, first responders will be overworked. They might not be available for a “minor situation.” However, the situation might be worse than they understand, and you might need serious help. Send a picture of how bad things are. You might not have time to type a message, and the lines might not be open long enough for a conversation. Write a note on paper, take a picture, and send that. In a minor fender-bender, with no injuries or disabled vehicles, most jurisdictions will tell you to “swap info and move along.” If that’s the case (always call 911 to make sure), photo the vehicular damage, people involved, witnesses at the scene (and their car tag numbers), and of others involved in the accident to show their injuries (or lack thereof). Take pictures of your wallet’s contents (or important documents) to record numbers, and show that cards are or were in your possession. Be careful with this info as it’s very sensitive and can be used for identity theft! If you’re the first to see the funnel cloud, hail, or a river overflowing, send a picture to the weather service or authorities as rapid proof an emergency is developing. The more first responders know about a collapsed house, an auto accident, a fire in progress, or any other emergency, the more rapid and appropriate a reaction they can make. Send picture of picture. In addition to last minute family photos, send a picture of a photograph in your purse or wallet of a missing family member. After a disaster, whoever goes home first, either you or your neighbors, could photograph area damage and relay info to the other. After a devastating incident, street signs will be gone, house numbers won’t be visible, etc. Take current pictures of landmarks or unique damage near or at your property to make it easier to find you. If you’re in an emergency shelter, and there’s an info bulletin board, you’ll need the info but might not be able to write it down. Take a picture! If you’re anywhere you’re not familiar with and there’s a posted map, take a picture of it for later reference if you get lost. When traveling to a new area, and you want to find your way back, take pictures along the way of landmarks at turns you make, forks in the road, etc. To relay information about medications, or if you have special dietary needs and are sending information regarding certain brands to someone, a picture really is worth a thousand words. Don’t trust your memory, trust a picture. Take a pic of where you left your vehicle either in a lot or in a parking deck. Should you break down and your vehicle shows outward signs of problems such as steam shooting from a hose, or liquids dripping from the engine, send a pic to a mechanic who may talk you through a quick fix. Copy posted business hours or listed service functions (and pricing) for later review and recall. This is also a good way to report price gouging. If you can’t get to your kids at school or other function, relay a picture of the person who is coming to pick them up. Send this picture to the school or function, and to your child (if they have a phonecam). You might be in a position to send pictures to people looking for loved ones or vice-versa. Whenever you get a hotel room, take a picture to find your way back. Photo the room number on the door, and the name of the motel and adjacent buildings. As with all belongings, take a picture to prove ownership. This might come in handy with theft in emergency shelters. It’s a rare occurrence, but be ready to prove things are yours. You’ll need something to entertain the kids. Give them a short list of things they should take a picture of. First one to take all the pictures wins! Another idea is to take a really close up picture of something while the kids aren’t looking, and have them figure out what it is. Let’s say looting or rioting is occurring. You can help police by secretively taking pictures of the perpetrators (not really recommended for safety reasons), or take pictures as you’re leaving to document the fact you weren’t involved. If a rescuer is picking up your child or pet, photo the rescuer (and the child or pet) and the vehicle they used. Photograph their name tag as well as registration numbers on helicopters, vehicle tag numbers, or names of boats. It may be a while before your insurance adjuster can arrive. Take pictures of the damage as you found it, and steps you took during cleanup. Regarding insurance, NOTHING beats documentation! If you buy goods or supplies, rent equipment, or hire a service, in addition to receipts, photograph the goods acquired, equipment being used, services being performed, and the people involved. Some scenarios will see you unable to return home. Some companies are trained and equipped to go into these areas to gather people’s belongings. Property photos will allow you to identify specific items you’d like retrieved. Authorities will want to know who is injured, dead, or missing, and who is okay and where they are. Taking pictures of those you meet along with way, or at your emergency shelter, will help ID the living and well. When possible, label each photo with the person’s name. Ever try to find the restroom in a foreign country and you didn’t know the phrase? Imagine how guests in our country feel in emergency situations. Pictures make communication easier, whether you’re trying to understand their needs, or relay yours. Let’s say after a hurricane, you’re one of the first families returning home, and you’re taking back roads. Authorities (or others following) might not have checked every avenue of return. If damage needs to be reported, or there’s no damage (report that too), sending a picture can relay tons of information. If family members are separated, or heading different directions, pass along traffic conditions or info from traffic warning signs. People have returned to a home undamaged by a disaster, but later looted. Since police might not be able to show up right away, take “crime scene” photos (for both Police and insurance). 45. Too much on the screen? Should the TV flash pertinent information and you don’t have time to write, or there’s a lot of text on a computer and you can’t print it, take a picture of the screen for later review. Medical needs are a real probability during an emergency. Since you can’t get to your doctor, and they might phone in a prescription to a pharmacy that doesn’t know either of you, use your phone to verify your identity to your doctor, and your doctor can relay the picture to the pharmacy. Suppose a developing emergency finds you low on goods and you send different people to different supply locations. If supplies are low, these folks can send a picture of the types or brands of items available so you can make educated purchase decisions. Though everyone should keep a “bugout kit” packed and ready, there will be items which cannot be packed in advance. In addition to a written list, create a photo file showing items you need to take (and their location) and steps to secure the house before leaving. Create a “travel atlas” of emergency assets available along evacuation routes. Include lodging, ATM locations, emergency rooms, etc. Travel the routes and take photos, or draw maps and shoot those. If a family member suffers from any reading disability, using photos is a must. Create a photo file that will relay your entire emergency plan without using text. Copyright 2005, Paul Purcell. About the author: Paul Purcell is a security analyst and preparedness consultant with over twenty years risk management and preparedness experience. He’s also the author of “Disaster Prep 101.” More information can be found at http://www.disasterprep101.com. Printed here with permission from the author. Awesome ideas. I guess I had better get one of those and learn how to use it. I never knew that you could do all those things. The trick is remembering all the different ways you can use the camera. I would suggest printing out the list and keeping a copy at home and in your vehicle. Thanks for visiting my blog. I liked this article, lots of good tips. However, I would have added alternative to not having a working camera phone, no power to recharge your phone, etc. In your bug out kit (if you can find one) an instant camera. I am a real newbie at this preparedness…any other ideas, I would love them. Julie, that's a great idea for a bug out kit/72 Hour Kit! I have a camera phone but a digital disposable camera would definitely be a great addition to our preps. Thanks for the idea! You can get a device that is a radio, flashlight, and solar and winding charger for your phone all at once. They are not at all expensive, either. Yes, a lot of folks have those in their emergency kits! My teacher linked this to our student portal. I am glad I read this and it is nice to know I have used this for some of the same things u have listed here! I will be using this is part of some of my assignments and in everyday life. Thanks for the tips. I have an Autistic son and this will help me out alot with him 2! Your phone can see in the dark!! better than you can. It also can detect people using night vision goggles and or infra red lights for night vision equipment. Something you should check with your phone is the ability of the camera to “see” infra red light sources. You can check this by turning the camera mode on and point the remote for your tv or any other remote with the little LED on the front at the camera lense of your phone. If you see a red light eminating (sp) from the front of your remote from the camera screen, your camera can see in the infra red spectrum. There are apps for smart phones for “night vision”. While not as good as real night vision goggles it could definitely help in a black out situation. 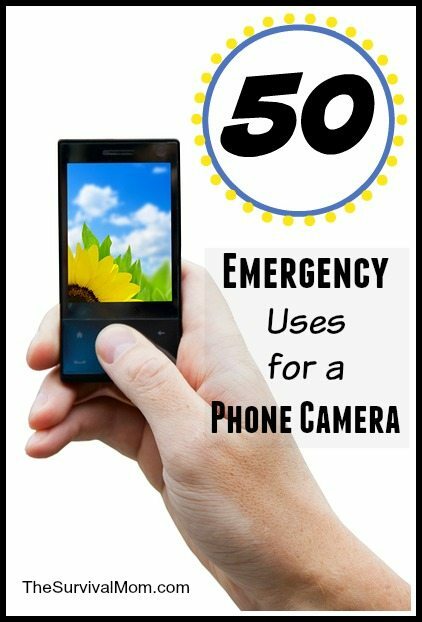 If you are evading or trying to find emergency crews having your camera on your phone turned on can help you find them. Using your flash on your camera can get the attention of rescuers in a night time situation. Using a remote control to signal between two parties using your phone camera to see the infra red signal allows you to signal without giving away your position to others. I have observed that in the world of today, video games are definitely the latest fad with kids of all ages. There are times when it may be extremely hard to drag your family away from the video games. If you want the very best of both worlds, there are numerous educational games for kids. Interesting post. Ya know – when they first came out I thought camera phones were the most idiotic thing anyone had come up with. But in later years I have used them quite a bit – including to document damage in an auto accident. Great list. We always use the video function before going to the doctors if our son has a worrying cough or something like that. It’s always good to be able to show the doctor exactly what we are talking about rather than trying to explain it. Another important use for a cell phone camera is to record all interactions with police. Jim, I would add to that, recording many different types of conversations and confrontations. It never hurts to have that as a back up should things go south in one way or another. You can also take a picture or scan important documents and send them to you self so you have soft copies if the originals are lost or damaged. I take photos of each of our family members cars license tags. This shows the expiration of the tag (too many to remember), color of car, license number to give police in case of emergency. Some of these ideas are just brilliant! I never would have thought of even half of these uses for my phone camera. With all the unrest in the world, this is the type of information people need. Keep up the good work! Just wanted to let you know we love your website. I’m the Social Media Marketing Manager at Homesteader’s Supply and share your wonderful articles on our Facebook page at least a couple of times a week. I keep photos of our prescription labels and supplement labels on my phone. That way, when filling out forms in doctors office, there’s no question who prescribe what and in what dosage. While not strictly emergency usage…I use my camera feature on the phone when I travel to document where I parked our car in the airport lot. When I arrive at the destination I video a complete loop around the rental car to document any pre-existing dings/scratches/dents. And for everyday use I use it as a magnifying glass to read tiny print without searching for a pair of reading glasses. And when we go to the mall, I do the same parking lot pictures of the car and identifying signage just like at the airport.